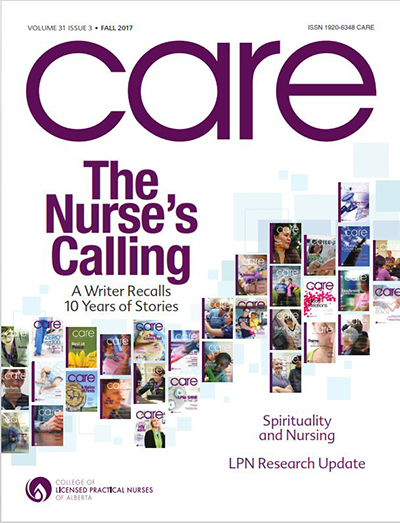 CARE magazine provides timely and relevant information regarding nursing practice, regulation, indisciplinary teams, provincial and national news to Licensed Practical Nurses, their employers, their educators and many more. 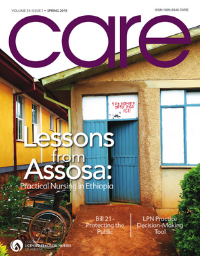 In a feature story ‘Lessons from Assosa: Practical Nursing in Ethiopia’ a licensed practical nurse writes eloquently about her time in Ethiopia: the challenges, the learning and all that she gained from her experience. ALSO IN THIS ISSUE: Bill 21 – Protecting patients from sexual abuse and sexual misconduct; LPN Practice Decision-Making Tool; Nursing with Heart: Harm reduction; Marni Panas – How to be a Better Nurse to the LGBTQS+ Community; Palliative Care – Things Every Nurse Needs to Know; Finding Joy: Strategies for Meaningful Activity for patients with Dementia. Today’s Licensed Practical Nurses are diverse in age, background and experience, but united by a commitment to caring for the public, one patient at a time. These real LPNs from across Alberta are examples of the dedication and caring of the LPN profession. ALSO IN THIS ISSUE: Embracing Innovation; Too Fit to Fracture: The LPN Role in Preventing Osteoporosis-Related Fractures; Bridging the Gap – Multiple Generations in the Workplace; Seeing the Whole Person: Complex Substance Abuse Disorders; Marni Panas – Her Story; Supervised Consumption Sites; Technology & Older Adults. 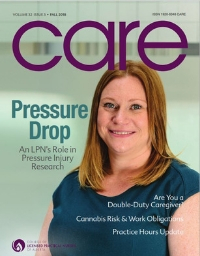 In this issue: ‘Pressure Drop: An LPNs Role in Pressure Injury Research’: An Edmonton LPNs curiosity makes her a perfect fit for technology-driven research into pressure injury prevention and education. Parent advocates’ power of compassion. Connect Care to improve case management: Communication. How dementia impacts Canadians. Cannabis risk and work obligations for LPNs. Are you a double-duty caregiver? The implementation of an Early Warning Scoring Test for Alberta Children’s Hospital. The Operations Room: News for CLPNA members. 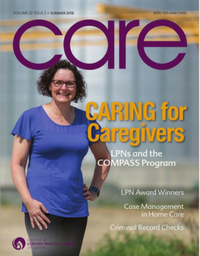 In this issue: ‘Caring for Caregivers – LPNs and the COMPASS Program’: A closer look at the facilitator-led program addressing caregiver challenges of guilt and grief, stress management, improving communication, navigation the healthcare system and planning for the future. 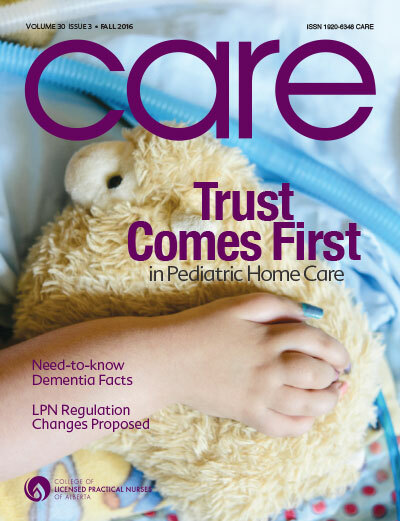 LPNs and Case Management in Home Care. Proclamation of Resident and Family Council Act. 2018 CLPNA AGM & Conference. LPN Awards of Excellence. Negligence Awareness in Nursing. The Operations Room: News for CLPNA members. 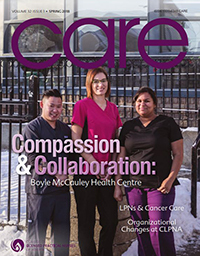 In this issue: ‘Compassion and Collaboration’: Licensed Practical Nurses at Edmonton’s Boyle McCauley Health Centre provide multi-faceted care for their vulnerable patients. Using patient and family-centre care to create exceptional patient experiences. The evolving role and opportunities for LPNs in cancer care. Preventing domestic violence. 4 Best Stretches for Nurses. Creation of a department-wide guide for nursing clerical tasks. The Operations Room: News for CLPNA members. 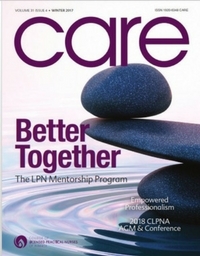 In this issue: Nurses in the CLPNA Mentorship Program share their ‘Better Together’ experiencesfor support, growth and creating new possibilities. Research: Empowered professionalism in practical nursing. All nurses are leaders. Why cancer survivors need to move more. Strategies older adults can use to protect themselves from falls. Made-in-Alberta consumer health websites. The Operations Room: News for Alberta’s Licensed Practical Nurses. CLPNA’s CARE magazine shares healthcare news for and about Alberta’s Licensed Practical Nurses (LPNs). 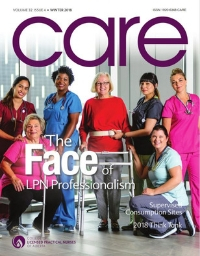 In this issue: “The Nurse’s Calling” recalls a decade of LPN stories and why nurses are ‘the most powerful connectors in the system’. “Finding Joy: Strategies for Meaningful Activity” helps nurses find realistic, thoughtful ways to engage resident/clients. “Are you Soaring Spiritually?” asks the big questions. Review & Update of LPN Competencies in Alberta published in peer-reviewed research journal. “Influenza Immunization” shares policy changes you need to know. 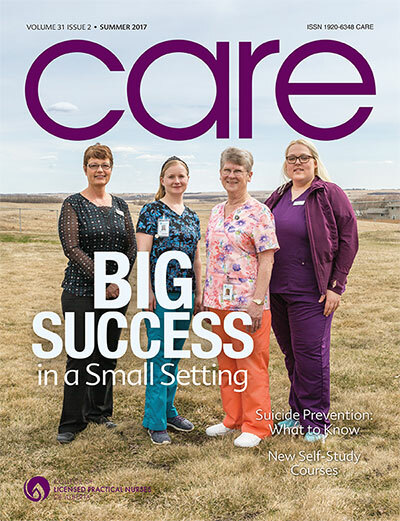 In this issue: Licensed Practical Nurses having “Big Success in a Small Setting”, find out why tiny Two Hills is a hotspot for nursing achievement and opportunity. 5 things we wish all nurses knew about suicide. Educating your patience on immunization. Research: A systemic review of published articles on infection control in Canada. LPN Awards of Excellence. A recap of the 2017 CLPNA AGM & Conference. And the Operations Room, news for CLPNA members. In this issue: Three Medical professionals cross the globe and become Licensed Practical Nurses in Alberta in our feature story, “A Brave New World”. A new way of looking at Pressure Injuries. Reclaiming Dignity in Healthcare: Small Gestures of Caring. Advancing policy to optimize the role of the Licensed Practical Nurse. RESEARCH: LPNs more effective with well-informed managers. Why rehabilitation must be part of acute care. Looking to boost your nursing competence? And the Operations Room, news for CLPNA members. In this issue: “Rise. And Shine. An LPN Pep Talk” features an award-winning young Licensed Practical Nurse building community. Collabrating toward Person-Centred Care. Enhancing palliative nursing competencies. Recognizing and changing healthcare workplace abuse. Research on connecting with people with dementia. Trauma-informed care. Nursing education website wins award. A heart to help others aboard the Africa Mercy Ship. Career planning resources and mentoring workshops. 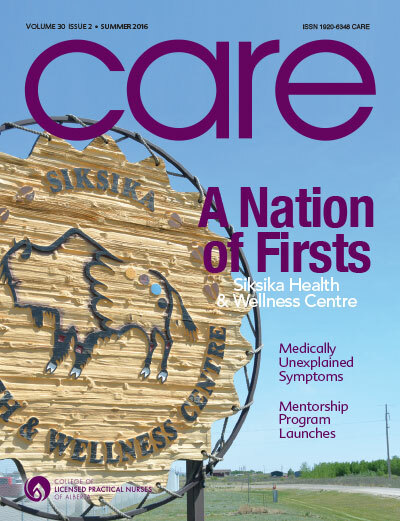 In this issue: Tradition and technology, plus a focus on treating the whole person, work together to make southern Alberta’s Siksika Health and Wellness Centre special, in our feature story “A Nation of Firsts”. Medically Unexplained Symptoms: The nurse’s important role in recognizing connections between stress and illness. Mentorship Program launches. CLPNA 2016 AGM & Conference Recap and LPN Awards of Excellence. Refresh your back injury prevention habits this summer. Tips on sharing unexpected health news with clients and their families. Apps for Today’s Nurses. The Elephant in the Room: Managing difficult conversations. The Operations Room: News for CLPNA members. CLPNA’s CARE magazine shares healthcare news for and about Alberta’s Licensed Practical Nurses (LPNs). 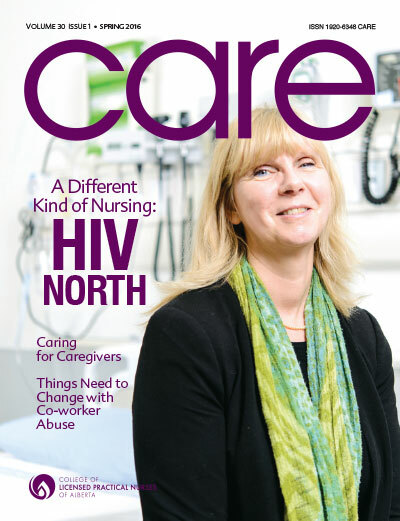 In this issue: “A Different Kind of Nursing: HIV North” Executive Director of HIV North, Susan Belcourt, LPN, leads a community of nurses whose goal is to educate and save lives in Northern Alberta. “Caring for caregivers” – Alberta Caregivers Association helps educate care providers. Things Need to Change with co-worker abuse. Innovating to breakdown intraprofessional barriers in nursing education. 10 tips to help older adults sleep at night. Technology: Mobile x-ray unit focuses on patient care. CLPNA’s CARE magazine shares healthcare news for and about Alberta’s Licensed Practical Nurses (LPNs). 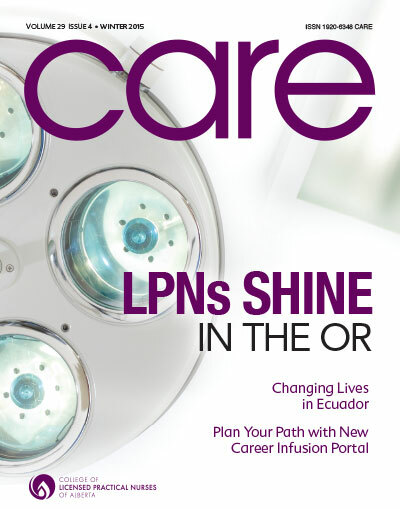 In this issue: “LPNs Shine in the OR.” – Licensed Practical Nurses find room to grow and excel in the operating rooms at the University of Alberta Hospital and the Mazankowski Alberta Heart Institute. Health system of tomorrow unveiled at CLPNA Think Tank. “Changing Lives in Ecuador”. Planning your path with the new Career Infusion Portal. Research: Can decreasing antipsychotic use lead to growth in mental and emotional health? Technology: Vein viewing technology lights the way. Embracing a multi-generational workforce. 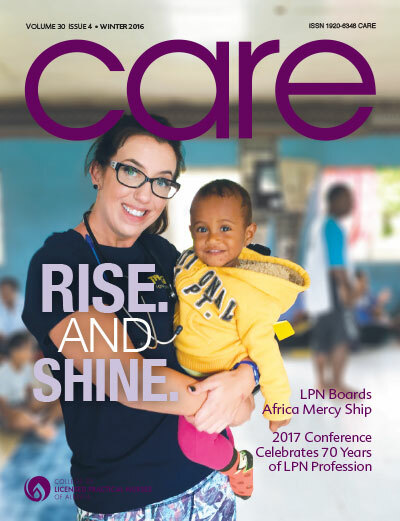 CARE magazine shares healthcare news for Alberta’s Licensed Practical Nurses (LPNs) such as nursing practice, regulation, interprofessional collaboration, provincial and national nursing news. Published quarterly, CARE is distributed to over 15,000 health professionals in Alberta including LPNs, LPN employers, education facilities, government, stakeholders and Canadian LPN regulators. In this issue: “Well. Within Reach.” – The Cardston Clinic is warm, welcoming and focused on preventative patient care. LPNs are a big part of the success of this community-centred clinic. “Dementia innovator sees key role for LPNs” interviews Dr. David Sheard. New Competency Profile for LPNs, 3rd Edition, tied to 2016 Registration Renewal. “Document evidence: It’s your best defense”. “Cancer & exercise: Living longer, living better”. 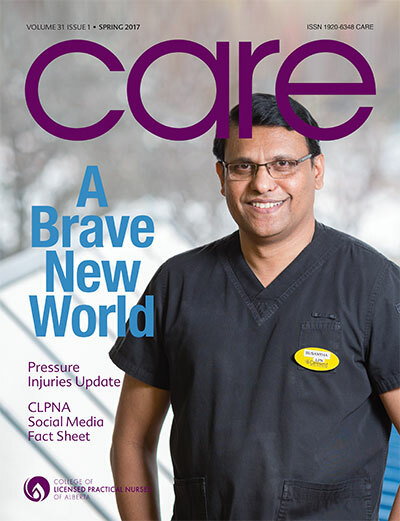 CARE magazine shares healthcare news for Alberta’s Licensed Practical Nurses (LPNs) such as nursing practice, regulation, interprofessional collaboration, provincial and national nursing news. Published quarterly, CARE is distributed to over 15,000 health professionals in Alberta including LPNs, LPN employers, education facilities, government, stakeholders and Canadian LPN regulators. 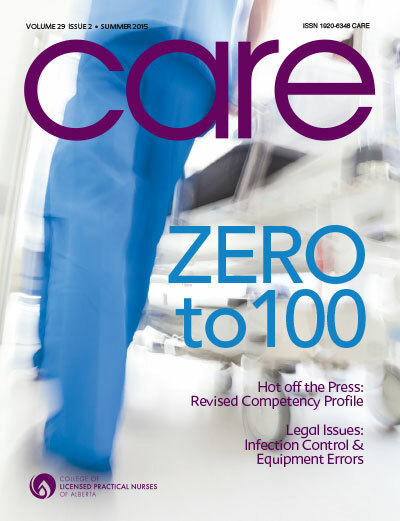 In this issue: “Zero to 100” – The team at Grande Prairie’s Queen Elizabeth II Hospital embraces change to meet the challenges of an exceptionally busy Emergency Department. “Work Smart with Client Information Technology”. A summary of CLPNA’s Annual General Meeting and Conference. Licensed Practical Nurse Awards of Excellence. Legal Issues in Nursing: “Infection Control & Equipment Errors. CARE magazine shares healthcare news for Alberta’s Licensed Practical Nurses (LPNs) such as nursing practice, regulation, interprofessional collaboration, provincial and national nursing news. Published quarterly, CARE is distributed to over 13,000 health professionals in Alberta including LPNs, LPN employers, education facilities, government, stakeholders and Canadian LPN regulators. 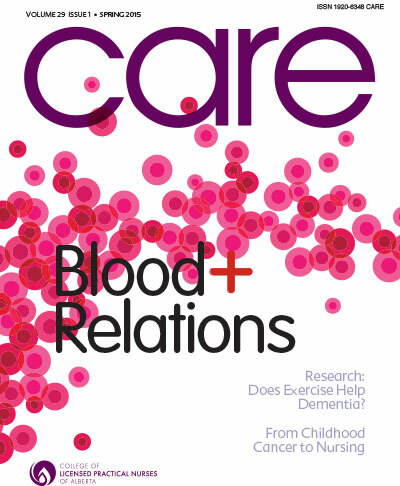 In this issue: “Blood Relations” – A Calgary hematology clinic is reaping the benefits of one Licensed Practical Nurse’s initiative to do more for patients and staff. Research: Does exercise help dementia? Profile: From childhood cancer to nursing. Watch Your Language: Accurate nursing documentation approaches. Technology: Digital health tools making a difference. 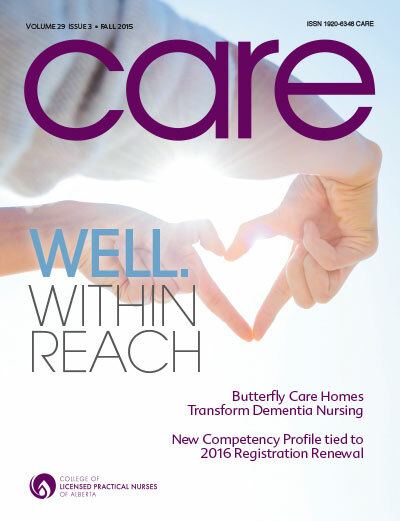 CARE magazine shares healthcare news for Licensed Practical Nurses (LPNs) in Alberta, Canada.